A major focus of the Trustees of Mary Aikenhead Ministries is formation. One significant response has been through pilgrimages. 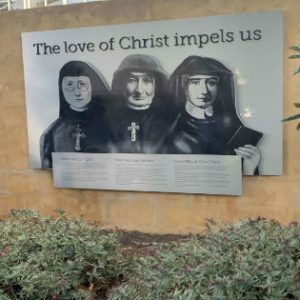 The Hobart Pilgrimage is entitled “In the Footsteps of Mary Aikenhead and the Sisters of Charity.” The Pilgrimage Leaders are Maria Wheeler rsc and Linda Ferrington rsc. The Pilgrimage begins gathered around a replica of Mary Aikenhead’s table where we introduce ourselves, celebrate our diversity and are missioned by receiving the Pilgrims Shell which is a universal symbol of Pilgrimage. Next, we gather dockside in Hobart to reimagine the experience of the arrival of Sisters de Sales O’Brien, John Cahill, and Xavier Williams. 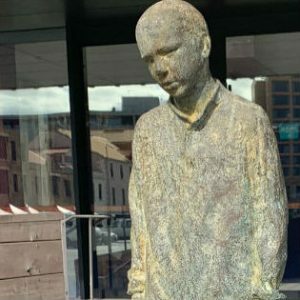 We then move to the Footsteps of Freedom sculptures which honour the convict women who were transported to Hobart and the horrific experience of being separated from their children as soon as they arrive. Following in the footsteps of the three Sisters of Charity who relocated from Sydney to Hobart, the Pilgrims celebrate Eucharist at St Joseph’s Catholic Church; the very same church where the Sisters worshipped, alongside the convent which would be home to the Sisters of Charity in Hobart for the next century, and the St Joseph School, where they would begin their teaching ministry. Archbishop Emeritus of the Hobart Archdocese, AdrianDoyle, a great friend of the Sisters of Charity and MAM, weaves together the story of the Sisters and the invitation to carry the legacy forward within the context of today’s ministries. Sister Anne Turner, the last remaining Sister of Charity in Hobart joins the Pilgrims for Mass and dinner which is a highlight for the Pilgrims. 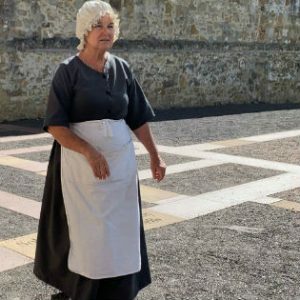 On day two, the Pilgrims explore numerous sacred sites throughout Hobart, and they are brought to life through the story telling of Maria Wheeler rsc. The Sisters’ education legacy in Hobart is explored by visiting St Aloysius Catholic College, Kingston and Mount Carmel College, Sandy Bay. 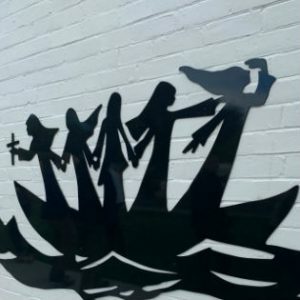 Mount Carmel College has portrayed a detailed history of the Sisters journey from Ireland through to the present day through a series of murals. The Pilgrims then witness and participate in a live history event at the Cascade Female Factory. This powerful evocation of the experience of one woman in a harsh and unjust penal system emphasises the unforgiving reality of the inmates’ lives, and of the challenges and hope that emerged as a result of the Sisters ministry. 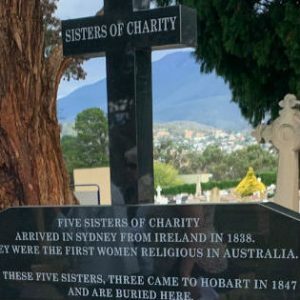 The Pilgrims travel to Cornelian Bay to stand before the graves of Mother John Cahill, Mother de Sales O’Brien and Mother Xavier Williams, to recall their deaths and pray in thanksgiving for the courageous spirit of these Sisters. The Pilgrims are then asked to reflect on what is the legacy they believe they will carry forward? The Pilgrimage concludes with each Pilgrim reflecting on their own experience, insights gained and being missioned to go forth to honour the contribution of these valiant women by bringing the Mission of God alive in the diverse contexts of our own ministry. These reflections lead to a greater understanding and appreciation about how the Spirit of Mary Aikenhead and the Sisters of Charity flourishes today. In addition, the bonds and relationships formed among the pilgrims over the course of the two days together is a wonderful outcome. I was privileged to be chosen to attend the Mary Aikenhead Ministries pilgrimage to Hobart March 7 and 8 this year. After attending the pilgrimage to Parramatta last year, I was looking forward to comparing the two different experiences, and visiting in person some of the significant sites I have learnt about as a part of my work at the Congregational Archives. I was also looking forward to contemplating the lived experiences of the many Sisters who have worked in Tasmania and the legacy they have left. These experiences range from the arrival of the first three Sisters in Hobart, on the Louisa in June 1847, who arrived under the assumption they would likely never return to the mainland, to meeting Sr Anne Turner, the last Sister of Charity still living in Tasmania. 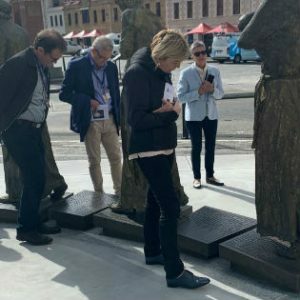 One of the first elements of the pilgrimage was a visit to the Hobart waterfront, to view the Footsteps to Freedom statues. This drew parallels to the pilgrimage to Parramatta for me, as the statues include the names of convict women and their children, from whom they were separated. This was reminiscent of the wall of remembrance at the Parramatta Female Factory, which includes the names of many women who were incarcerated there. The statues with the names created a tangible representation of the heartbreaking experience of many convict women. 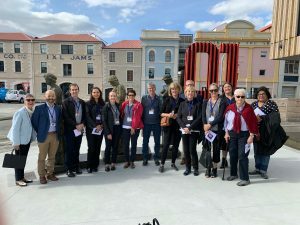 Our pilgrimage leaders were able to guide us in imagining the unfamiliar, daunting landscape that would have faced the first Sisters when arriving in Hobart. The power of the landscape confronted them immediately, as a lack of breeze meant the first three Sisters were stuck on their ship in the harbour, unable to reach the shore. The unforgiving natural environment the Sisters were confronted with when stuck on their boat in the depths of a Tasmanian winter ominously foreshadowed the brutal human-made environment they would find at the Cascades Female Factory. 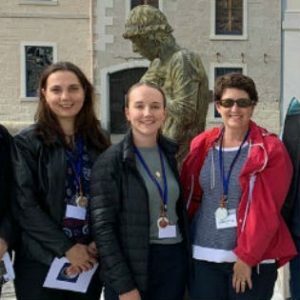 Having the pilgrimage led by Sr Linda Ferrington and Sr Maria Wheeler meant that we received valuable insights into the Sisters’ own lived experiences of their ministry in and ongoing connection with Tasmania. These experiences were shared by both Sisters with their unique senses of humour and candidness. 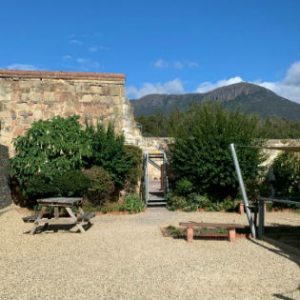 The ongoing connection to the legacy of the first three Sisters in Tasmania, Mr M John Cahill, Sr M Francis de Sales O’Brien, and Sr M Francis Xavier Williams was most evident at St Aloysius Catholic College, Kingston and Mount Carmel College, Sandy Bay. At Mount Carmel College in particular, I was struck by the strong sense of the heritage of the Sisters of Charity and how this has been embraced by the school today. A number of commissioned artworks decorate the school campus, including depictions of Mary Aikenhead, the first five Sisters and the history of the school itself, which come together to form a Foundation Walk. The mural which forms a part of this walk is a beautiful collaboration between three artists-in-residence at Hullabaloo Studios and students of the College. It was wonderful to see the spirit, legacy and charism of the Sisters embraced so strongly by the school community. It felt fitting that the pilgrimage coincided with International Women’s Day on the Friday and our visit to the gravesides of Sisters of Charity at the Cornelian Bay Cemetery fell on the 127th anniversary of the death of Sr M Francis Xavier Williams, one of the pioneer Sisters who is buried there. The pilgrimage was a poignant and valuable experience that I will continue to reflect upon. Images: 1 – Pilgrimage group; 2 – Mary Aikenhead Ministries logo; 3 – Cascades Female Factory; 4 – “Mary”, part of the historical reenactment; 5 and 6 – murals at Mt Carmel College; 7 and 8 – Footsteps to Freedom statues on the Hobart docks; 9 – gravesite of the early Sisters; 6 – Natalia Didenko (left) and Imogen Kennard-King (centre with another pilgrim) on the docks in Hobart.